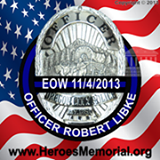 A Celebration of Life for Oregon City Police Officer Robert Libke, killed in the line of duty earlier this month, is set for Thursday, November 14, 2013 at 1 p.m. at the Veterans Memorial Coliseum in the Rose Quarter area. The motorcade procession involving family and public safety/emergency response vehicles, set to begin at 10:45 a.m., will cause some TriMet service impacts. TriMet riders should be prepared for delays, especially in the Rose Quarter area. MAX trains will be held at times to allow sections of the procession to cross. Buses will also be stopped at times and may experience additional delays traveling between Oregon City and Portland. Delays should be expected through about 4 p.m. The public attending the event is encouraged to use TriMet or carpool to Veterans Memorial Coliseum. All MAX lines and six bus lines serve the Rose Quarter area. For more information about the event, visit the Oregon City Police Department website. We at TriMet send our thoughts to the Libke family, his fellow Oregon City officers and all the law enforcement officers who risk their lives every day to protect and serve our community.